Sponsored by the Town of Winterport. 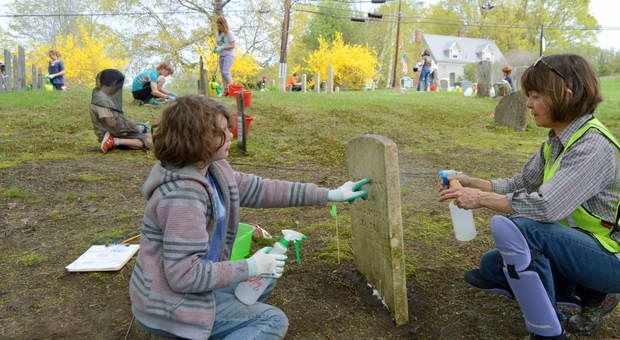 Trained volunteers from the Maine Old Cemetery Association [MOCA] will lead an all day Cleaning Workshop at the Oak Hill Cemetery. The workshop will include a demonstration of correct materials and procedures for properly cleaning gravestones. Registered attendees will have the opportunity for supervised hands-on practice using the learned skills. This workshop will use materials and methods approved by MOCA. Documented direct descendants of any of the persons buried in Oak Hill Cemetery who do NOT want their ancestor's stone cleaned by this group should contact Laurie Albert prior to May 12, 2018. The Winterport Cemetery Association which cares for this cemetery has authorized the work. The workshop is open to the public with a limit of 20 participants. Advance registration [$5] is required. Registration forms are available at the Winterport Town Office.